Right, here this: After 374 years of Slater Street posturing, Liverpool’s iconic independent record shop Probe has hop-skipped-and-a-jumped over to School Lane. Bob, Lee and co reopen for business today. With that in mind, Getintothis cornered some of Liverpool’s lovers of non-square sounds on the musical bunker which has played a major role in shaping their listening habits. 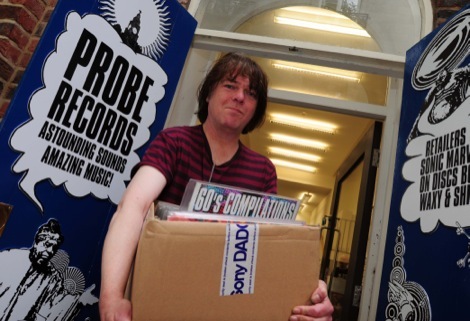 Getintothis: It’s the start of a new era today, as Probe moves from the corner of Slater Street to some jazzy new pocket on School Lane, tell us what the first record you bought there was and the last. Pete Bentham: (Singer, songwriter with Pete Bentham & The Dinner Ladies): I can’t think what the first record I actually bought at ‘Probe Slater Street’ was, but the first one I remember buying is the CD verison of the first Jonathan Richman & The Modern Lovers album which is quite possibly my fave album of all time. So that’s probably the best compliment I can give them. Andrew Ellis: (Samizdat promoter): The last was Holy Roller‘s As Is. The first was fIREHOSE – Ragin’ Full On. Unfortunately I am of an age when I bought my first records from Probe on Button St. It was always the ‘meeting place’ on our way to Erics for the Saturday matinees as a kid. I can’t remember the first record I ever bought from there but I do remember an episode when I wanted to buy a point of sale cut out of Bowie that was being used for the Lodger album. He then tore it in half in front of me and threw it over his shoulder into a bin. I left with tears in my eyes. I am very happy to say the customer service has not changed a lot since and I have to also say that is why we love it so much. 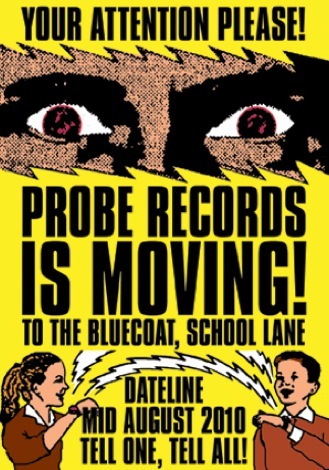 Long live Probe. Gen Er Al Midi: (a.P.A.t.T. bro): It’s safe to say without Probe, a.P.A.t.T. probably couldn’t be who they are. As kids some of us bought hard to find grindcore, The Residents and such other oddities not available anywhere else and as performers a.P.A.t.T. have had nothing but support from them. I remember they really helped sell many copies of our first ep (e.P.) by simply recommending to their CD buying public, can’t say fairer than that. It’s how it should always bloody work! Paula Stewart (promoter at the Masque Theatre): I’ve only been in Liverpool seven years, but I remember buying this clearly: Edan Beauty & The Beat. I remember I was looked at as if I was dressed wrongly when I asked if they had it in stock. I probably was dressed wrongly, I usually am. I bought it for an ex-boyfriend. The only decent thing he did in his life was introduce me to Edan and I was stunned when a local record shop had it in stock. 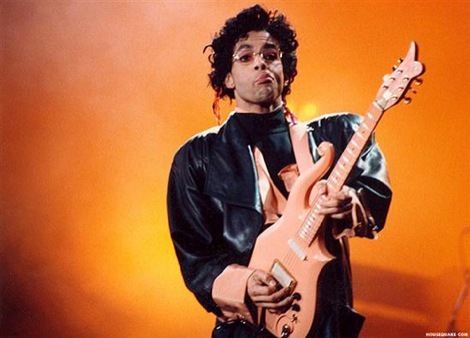 Darren Roper: (Meshuggy promoter): A pivotal moment in my music history came when the guys at Probe handed me a copy of 1000 Hurts around 2001. Shellac of North America had always been on my buddies playlists but not mine so I took my clueless little self to Probe and left with a huge smile on my face. Mark McNulty (photographer): End of an era? Well they’ve already had one or two of them and they’re still here doing what they do best but just in a new location. It’s just change and I think their new home is well-placed close to both jazzy new Liverpool and The Bluecoat, which is nice, and only pouring distance from the Post Office pub which is nice too! Having shopped in the Button Street store (now Ted Baker) the first record I bought at ‘Probe Slater Street’ merges in with a whole lot of others but Tranquility Bass‘ Cantamilla is probably a good guess at an early purchase. James Rand (DJ at Peacock, Chibuku, Warehouse Project among others): I think it was a 7″ of Bonde Do Role – Solta O Frango on Domino. I’d been in and enquired about the Ed Banger and Kitsune stuff they had a few times but never bought anything and then one time, Lee put this on whilst I was in the shop and I went over to ask what it was. I later discovered that Lee had a habit of putting on a record he knew I would want and I reckon the first thing I bought was a result of this. The first vinyl I bought was B12‘s Electro Soma. This was when Probe was in the now Ted Baker. The last vinyl was only bought last week and it was a white one-sided vinyl by Aeroplane – We Can’t Fly. Mike Doherty (writer for The Fly among others): The first was ÃÂ¿CÃÂ³mo Te Llama? by Albert Hammond Jnr and my last The Suburbs – Arcade Fire. Getintothis: My favourite bit about Probe is the ridiculous, yet lovingly-crafted genre stickers they place on the record sleeves telling you what delights are contained therein. What are your Probe best bits? Pete Bentham: My fave thing about Probe is the obvious personal touch. I remember I was looking for a birthday present for Louise, singer from ace Liverpool punk band Flamingo 50 a few years ago and couldn’t think what to get. So I went in Probe and told them who I was lookng to buy for and they immediately pulled out a CD by a fairly obscure American all girl pop punk band which she loved. You couldn’t get that in a big chain store. Andrew Ellis: The phenomenal second hand section, I’ve got all kind of gems from there including a mint condition copy of The First Four Years by Black Flag for ÃÂ£4. Bob‘s posters lining the walls are also awesome. Dave Pichilingi: In the old days you could reserve a poster on the walls of Probe by signing your name in the corner of the poster. This was the unofficial (official) way of getting all the wonderful posters that adorned the posters of the shop. I got many an ace poster like this including ‘The name of this band is Talking Heads‘ album poster that I still have to this day with my autograph scrawled in the bottom left hand corner. Paula Stewart: I love the way you can’t see in and you can’t see out for all of the posters. It’s like one giant pin board. Darren Roper: I love the genre stickers too – insight without working hard to find the good stuff yourself. Saying that I never remember them once the plastic sleeve hits the floor! One treasured record I found was Scratch Acid by Berserker. It was Lee and Bob‘s write up that said ‘band prior to The Jesus Lizard‘ that sold me. Many records later – all bought because of the genre hopping stickers. Mark McNulty: They’ve got a habit of remembering what everybody who’s ever been in there actually likes and always offer up something you’ve never heard of if you look like you’re ready to shop but haven’t made an obvious choice yet. They’re sort of like a real world equivalent of ‘Amazon recommends’ only you don’t have to wait in for the postman. James Rand: There was a point when I was spending a fair bit in there and I used to go in and there would be a few records put aside with stickers with my name on them. Now, that is a good record shop. My copy of Alter Ego – Why Not? still has that sticker on it. Paul Hutchinson: Mark who used to work there – rest in peace. He died in Le Bateau. The techno section went massively down hill after this tragedy. After getting to know him, he knew what I liked, when I went into the shop I wouldn’t have to go crate digging, he would have a pile under the counter waiting for me. I remember buying Fish and Chips by Hardfloor – special first edition on gold vinyl with a gold sleeve for the 50th release on the Harthouse label. The shop got two copies – one’s in my studio. Cheers Mark. Mike Doherty: Hanger after hanger of Half Man Half Biscuit t-shirts. 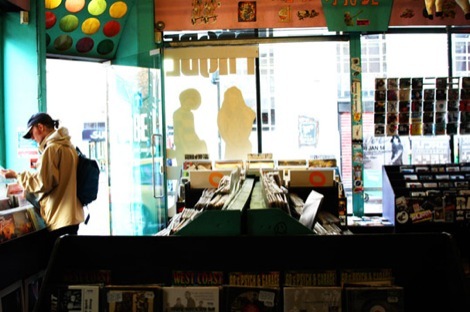 Getintothis: Probe is our fave record shop, but which other indie (the world over) do you love? 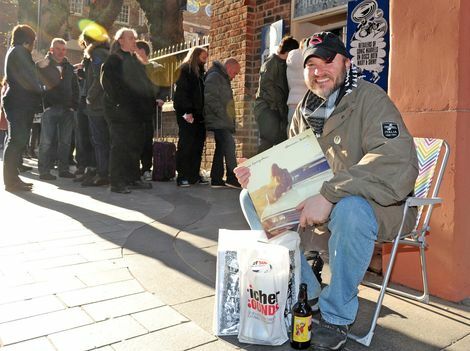 Pete Bentham: I like a great little punk record store called All Ages Records in Camden – it’s not far from the Worlds End pub. Andrew Ellis: Other Music off Lafayette in Manhattan is a total dream, their stock is basically my dream record collection. Dave Pichilingi: Rough Trade is up there. Paula Stewart: I’m gonna say the now defunct Andy’s Records just because I used to work there. The last song we played before we closed the doors for the last time was Kiss God Gave Rock N Roll To You. Good times, good times. I really liked Selectadisk in Nottingham before it closed. Tempest in Birmingham, Piccadilly in Manchester and many more to name but a few. I don’t even want to get into American record shops as I am British and its all about British independents. Mark McNulty: Amoeba in San Francisco which is a blowing alley converted into an indie record shop! James Rand: Hardwax in Berlin, Rough Trade in London, Vinyl Exchange in Manchester. 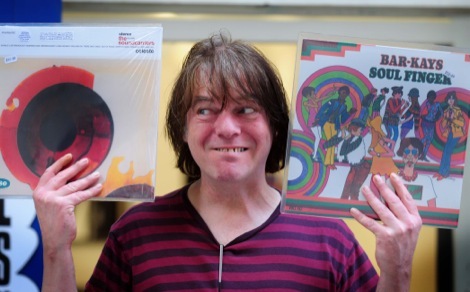 Paul Hutchinson: Vinyl Exchange in Manchester, Disco Paradiso in Barcelona. Mike Doherty: There used to be a record store back home called Sonic Boom. It was basically a Mecca for me in my late teens. it stocked some of the greatest modern and second hand vinyl and I was gutted the day it closed.